Discussion in 'Released' started by Lunatic Lobbyist, Jul 5, 2017. Does it bother the crap out of you? And if it didn't before, does it now? Are you a lunatic like me? This pack offers something a bit different from others you might've seen. The intent is to keep Terraria's original aesthetic, but breathe some life into it. Originally this was considered to be purely a 'color-correction' texture pack, but it became a bit more than that. All textures have been created/modified by yours truly, mostly from Terraria's original content if not completely new. A huge thanks to @Murphmario for helping me solve the problem of editing water -- that would've taken a lot longer to figure out on my own. Also thanks to @Brutallama for being an inspiration in making this -- showing how much texture packs can improve Terraria. And last but not least, a thanks and shout out to @ChippyGaming for kindly spotlighting my pack on his mighty-fine Youtube channel. Feel free to let me know what you think of the changes -- especially after playing in-game. I'm open to suggestions, if they seem in-line with the theme. And most importantly, enjoy Terraria with Better Ambiance! PixelCherries, BattleDragon45, Darkblane257 and 32 others like this. Does it bother the crap out of you? If you've answered "yes" to most of the above, then this texture pack is for you! - This texture pack offers something a bit different from others you might've seen. It was started by editing the color and vibrancy of the sky, in order to help bring Life to the game's ambiance, adding a LOT of depth, better-matching background elements, and just looking nicer. To change the color of standard water, you must overwrite a file in the above folder called "water_0.xnb". I also help guide you to this location in the download. I recommend backing up the original "water_0.xnb" somewhere safe if you want to revert to the original water, or I may just include the original in the download at some point. Let me know what you think of this texture pack -- I'm open to suggestions, if they seem in-line with the theme. I really enjoy the look of this, it feels livelier and I didn't think such a small touch could make a big difference. Vladimier, Creeper da Snek and Lunatic Lobbyist like this. Erikfassett, Mr. Melon and Lunatic Lobbyist like this. This is nice! I approve of these touch-ups! MildlyImperfect and Lunatic Lobbyist like this. Mr. Melon and Lunatic Lobbyist like this. I just tested it in game and this is so awesome! 'tis a huge improvement than vanilla's! Sorry i'm still new to the whole 'texture packs' thing, so will this work with tmodloader? Your texture pack is nice but I think the darker ambience in terraria is intentional. The focal point of terraria is your immidiate surroundings. The ambience is just there to spice things up. Thank you everyone for the kind words! It goes a long way. In the meantime, I do plan on making some additions and further improvements at some point. If anyone has any suggestions, feel free to let me know. I'm just glad to see others are enjoying this, which made it well-worth sharing with everyone. You can even combine my work with other texture packs as well, such as Brutallama's Vanilla Revamp. As long as all the textures stay in one "Texture Pack.zip", they're 100% compatible! That's one way of looking at it. My primary motivation for making this was to get rid of the gloomy, flat, un-matching colors in the background -- because that very thing distracted me from my surroundings. But you're certainly free to your opinion. One perk to having OCD is having higher standards! Thank you for the overwhelmingly-positive and helpful feedback. This is what I really like to hear -- and it's much appreciated. Neopffe and DontEatSocks like this. The folder 'TexturePacks' didn't exist, so I created it myself. It doesn't work. 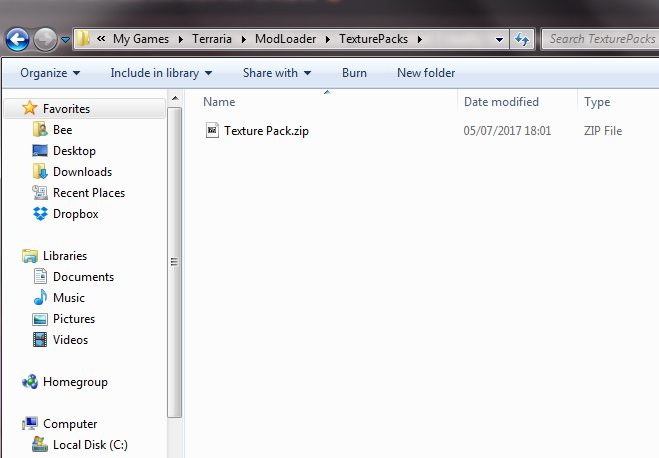 I believe the TexturePacks folder should've already been there if you've already installed and activated tModLoader in-game, so there could be another problem. Turning on experimental features in-game did the trick. Thanks! I've turned on experimental features in both the game and the config file, but the modded game doesn't seem to have any changes, aside from the water (which looks slightly dodgy when on slanted surfaces). It's looking nice, but I feel like this texture pack takes away the depth of the background layers that they had before. Because the furthest mountians only seem to blend worse with the sky. The background of the ocean water doesn't seem to match close to the actual water texture either. I'll prefer to stick with the vanilla version. I love the sky and sun details though. You want to make an extra folder there called \TexturePacks. Most people (myself included) will have this folder automatically appear upon installing tModLoader, although for some odd reason, some people must make this folder manually. Any place other than the correct folder will certainly crash your game. I can include a readme file with the download if you think it'll make things easier. Anyway, hope that solves all your problems! Hmm... blending in those areas should look significantly better, rather than worse. Are you sure you installed the separate water file? Because the ocean water won't match at all if only the texture pack is installed without the additional water file. As far as blending mountains, does it look a lot different from my screenshots? If so, something was installed incorrectly. At the moment I'm only judging from the screenshots on the thread. I was wondering if these screenshots are exactly the same as the difference in-game. Because the different water texture doesn't seem to be present. Ahhh ok, that makes a lot more sense. Your own in-game appearance may vary a bit (for all sorts of reasons), but it should be pretty close. As for the water, keep in mind the snow biome's water hasn't been altered, so screenshot 2's water looks identical to vanilla. What you're looking for specifically are the "after screenshots" 3 and 4. The primary thing that's being changed is the hue/tint of the water -- it's far less purplish, indigo/blue, and more of an ocean blue. This is far more noticeable with the sky and ocean biome's background -- what was closer to a purplish color, is now closer to a more a realistic sky blue (among other improvements to contrast and detail). It's all designed to match together that way. Now in screenshot 3, you'll notice the water is much darker-looking than the background's water, although the reason for this is clearly seen when you're in-game. If you look at screenshot 4, the water in the background gets much darker as the gradient continues downward. So if I jumped up in screenshot 3, or the surface of the sand was lower (which it frequently is with other worldgen) in screenshot 3, the foreground water would be the identical color and brightness of the background water fairly quickly. This creates the illusion of depth and perspective. If this isn't making sense, let me know. But it all comes together in-motion. Of course it still may not be to your tastes, and that's perfectly fine. But if you're still interested, I'd encourage you to try the pack -- as that's the only real way to have an educated opinion on whether or not the changes work for you. I've followed your instructions and the results are still the same. Are there any other possible reasons as to why this is happening?